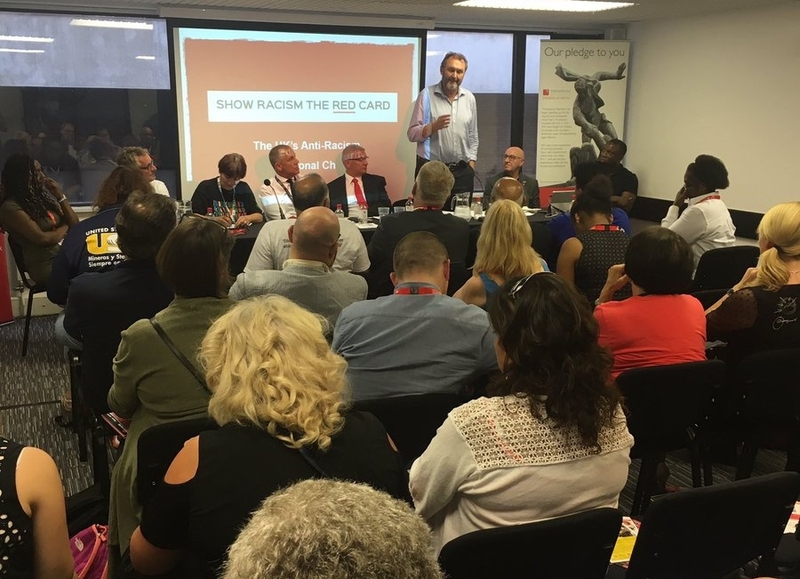 Show Racism the Red Card (SRtRC) attended this year’s Trade Union Congress National Conference in Brighton and held a fringe meeting which focused on tackling the current rise in racism through education. The reported rise in hate crime and overt instances of racism over the last few months have highlighted the relevance and necessity of SRtRC’s anti-racism education work, and the charity remain committed to educating young people throughout the UK. The meeting benefited from a fabulous line up of speakers including new SRtRC Vice Presidents; former General Secretary of the National Union of Teachers (NUT) Christine Blower and former professional footballer and TV pundit Leroy Rosenior. Joining Christine and Leroy was current NUT General Secretary Kevin Courtney and GMB General Secretary Tim Roache, UNISON President Eric Roberts and UNISON Regional Secretary Clare Williams. MP Ian Lavery once again showed his support for SRtRC and an exceptional panel was completed by UNISON’s Liz Cameron, Unite the Union’s Director of Legal Services Howard Beckett and Stephen Cavalier, Chief Executive of Thompsons Solicitors. SRtRC Vice President Leroy Rosenior spoke passionately about his own experiences of racism, as well as that suffered by his father and his son. He also talked poignantly about the homophobia suffered by Justin Fashanu during his career and reflected on how powerless he felt to support his one-time team mate and how much he regrets not challenging the prejudicial treatment he faced. Other speakers urged those present to get behind fundraising initiatives like Wear Red Day; a national day of action which encourages schools, businesses & individuals to wear red and donate £1 to help facilitate the delivery of anti-racism education for young people & adults throughout England, Scotland & Wales. SRtRC would like to pay tribute to the individuals and the organisations they represent, for once again taking time out to lend their support to the anti-racism charity. It was fantastic to hear the high regard in which SRtRC’s anti-racism education work is held, but the message which resonated most loudly was the need for increased funding and further support during challenging times. Great fringe with @SRTRC_England at #TUC16 in Brighton. We have a battle on our hands but we know our battleground: education & children. SRtRC would also like to thank sponsors Thompsons Solicitors for their unwavering support over a number of years.